This Thursday is full of cool events. I already wrote about Downtown Neighbors and Local Flavors, but if that didn’t interest you or you couldn’t get your RSVP then you’ll want to check out this event. Every third Thursday of the month the cute, hip area located at the corner of Edgehill and Villa host a cool event. 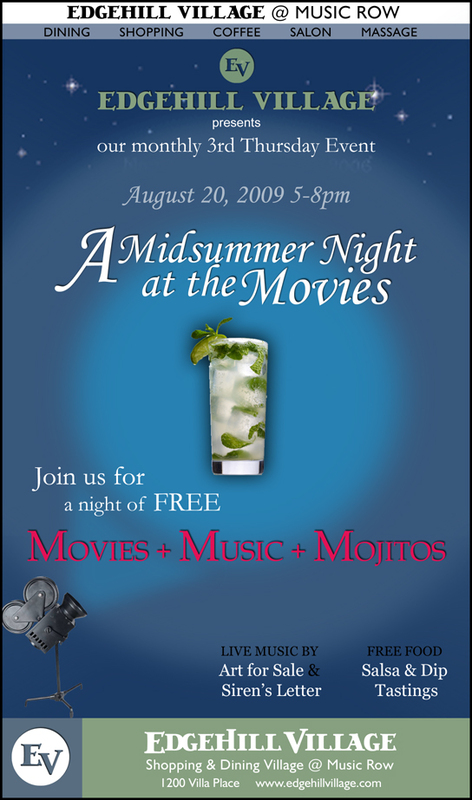 Last month there was a barista throwdown, and this month brings us A Midsummer Night at the Movies: an evening of free movies, music, and mojitos. I have no idea what movies will be shown, or where they’ll be shown, but I’m sure it’ll be a lot of fun. You’re sure to fall in love with Edgehill Village and meet some cool people. There is plenty of (probably) free parking in a lot by the bakery. Street parking is also an option. Who is 8 off 8th’s Surprise Guest Tonight? Aw, Look Who Got a Website! Pretty cool event. There wasn’t a lot of people there, but a designer store had the free beer/wine/mojitos. We got there about 45 minutes before it ended and the mojitos were extremely watered down, so just get there earlier and catch the movie too. This time it wasn’t anything great- Lemony Snicket- but it could be fun if they do this every month. You’ll be glad to know that Edgehill Village does hold this event every month. Every 3rd Thursday, in fact. I hope you hit it up next month too! Maybe you’ll get a little more kick in your mojito.